With 15 games remaining, Liverpool top the table by four points, with City behind us on 56. Mauricio Pochettino’s Spurs are a further five points back on 51 – and we can probably rule out anybody else in terms of potential champions! Chelsea are on 47, but they’re in poor form and there’s realistically no way they’re going to overtake the three teams above them. If you think Liverpool can secure the title for the first time since 1990, then check out the best odds via this online sports betting site. The Spaniard has selected David Silva and Bernardo Silva either side of Fernandinho, and in the most part, it’s worked superbly. Belgian superstar De Bruyne is back now though and he’ll play a huge part in the final months of the campaign. “There’s two teams and even Tottenham, who have so many points at this stage of the season,” the 27-year-old said. “It’s quite remarkable because in a lot of seasons you would already be 10 or 12 points ahead, but this season it’s tight and I like it. 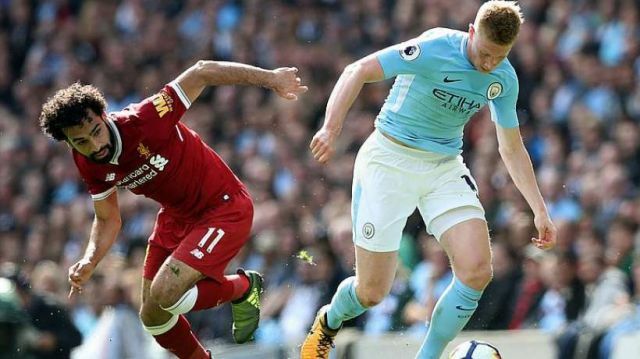 We’d argue that De Bruyne is probably the best midfielder in the country, so for City to do so well without him shows how incredible their depth is. Liverpool’s midfield gets criticised, but for us, it’s underrated. Fabinho is improving week in, week out, and has started to more than pay back his £40m transfer fee from AS Monaco. The Brazilian is versatile, tactically adept, powerful and can pass the ball, too. What we like about him is he gets his head up and looks to create, rather than always going sideways or backwards – a trait common of holding midfielders. Gini Wijnaldum has been one of the best midfielders in the country this term, although he’s gone under the radar. The Dutchman is superb in tight areas and threads together our play fantastically. In our last match against Crystal Palace, we actually missed his discipline. On top of those two, we have club captain Jordan Henderson, who is a real leader and has improved as the season has progressed, the ever-green James Milner, still doing the business at 33 and Naby Keita – who has bundles of talent and will come good when he adapts to English football.